This is a quick and light batter that works well for mildly flavored fish. 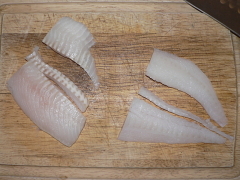 Take each fillet one at a time and make sure there are no scales or pieces of bone left in. 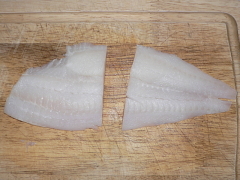 Divide across the middle of the fillet. Cut each piece lengthwise. On mine, there was a bit of a rough edge along the centerline where the ribs had been attached. If you have the same, trim out a little bit along either side of this line. You can see that there is really not that much waste due to trimming the rough edges. If you give the trimmings to your cat, don’t be surprised if he doesn’t go crazy for it like you expected. House cats are so used to canned food that they may not immediately recognize this as food. I used olive pomace. You can also use beef tallow or lard, but avoid peanut oil or anything else with a noticeable flavor, which can overwhelm the flounder. 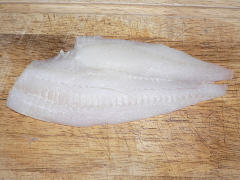 If you’re using tallow or lard, and you typically reuse it, be aware that fish has a tendency to leave behind some flavor. Only use a fat that you’re going to keep separate for frying fish. 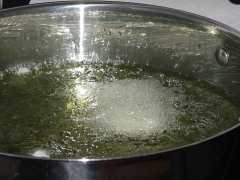 Whatever fat you choose to cook with, use enough to fill a heavy-bottom pan about three-quarters of an inch deep. Heat it up to just below the smoke point, which will vary based on the oil you use. 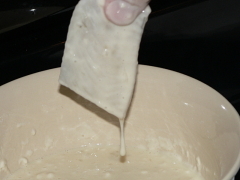 If you’re using a solid fat like tallow or lard, start heating it before making the batter. If you’re using a liquid, make the batter before starting to heat the oil. 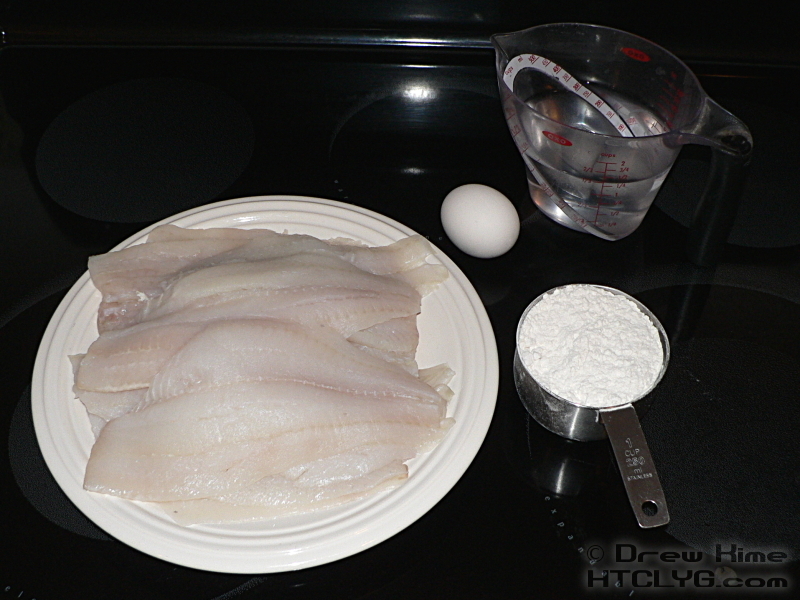 Now that the fish is prepped and the fat is heating, it’s time to make the batter. Tempura is dead simple to make, and with something as delicate as flounder you really don’t want anything more substantial. 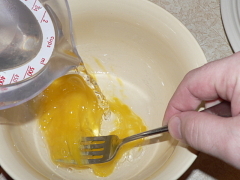 Start by beating the egg together with the ice water. 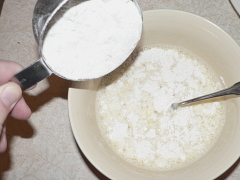 Then mix in the flour. That’s it. The batter is ready. 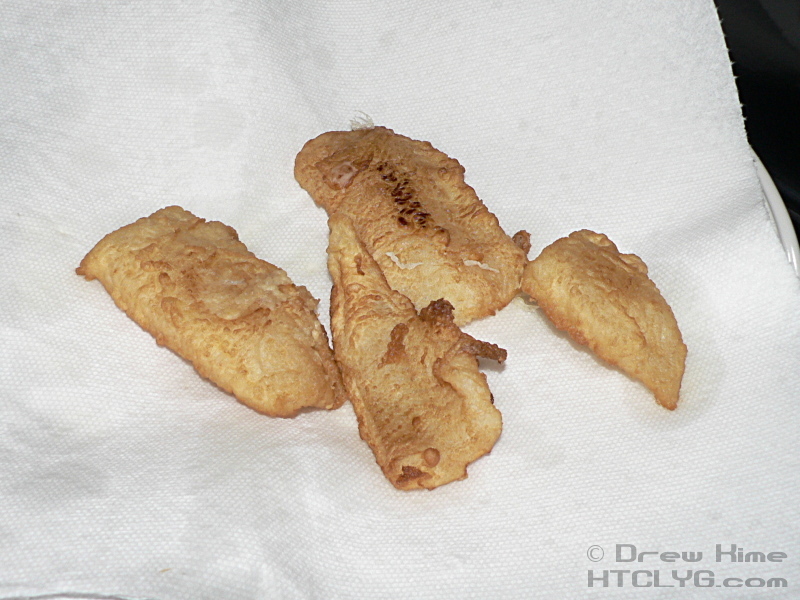 Once the oil is hot, dip the fillets one at a time into the batter. It should be very thin. Let it drip off a little before putting it in the oil. The oil will start bubbling furiously as soon as the batter hits it. Don’t drop the fish in, but don’t go slowly either. Lay it in and get your hand back quickly. It’s a good idea to wear long sleeves when deep frying. See the bottom of this post for what can happen when you don’t. 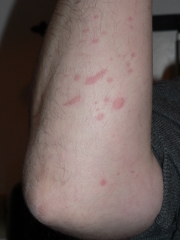 Fry in several batches. 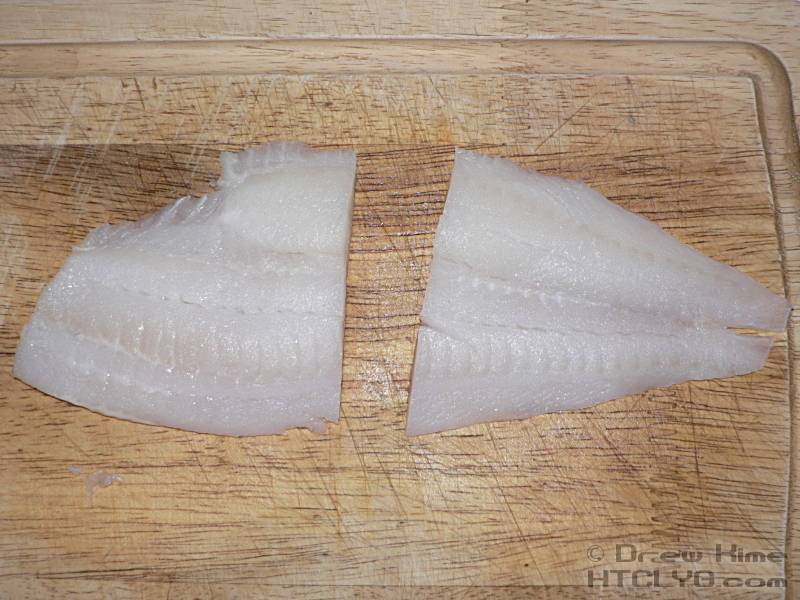 There should be a little room around each piece, or they will stick together and not cook evenly. Turn them over once when the edges start changing color. It will probably take less than a minute per side. 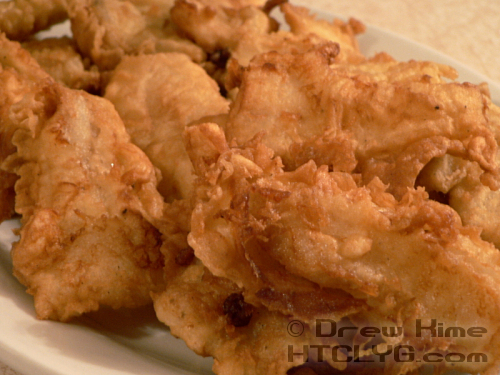 When they are golden brown on both sides, remove the first batch to a plate with a double layer of paper towels. Repeat with additional batches until everything is cooked. Don’t worry too much about keeping the finished pieces warm. As fast as it cooks, unless you’re making enough for a scout troop the first batch will still be pretty warm when you finish the last. Arrange everything on a platter and serve with lemon and tartar sauce. If you don’t use lemon and tartar sauce, you might find the need for a little salt and pepper. Next time you make this recipe, add the seasoning to the tempura batter before dipping the fish. Up above when I said to wear long sleeves, this is why. 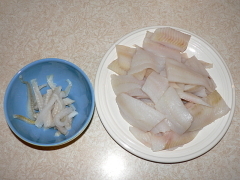 The way I had the plates arranged on the stovetop, I had to reach across the oil to dip the fish in the batter. I was just dipping a piece when the last one popped. Take each fillet one at a time and make sure there are no scales or pieces of bone left in. Cut each piece lengthwise along the centerline. Trim out any rough bits where the ribs attached. Fill a heavy-bottom pan about three-quarters of an inch deep with neutral-flavored oil, like olive pomace. Heat it to just below its smoke point. Beat the egg together with the ice water. Add the flour and mix it gently, just enough to get most of the lumps out. 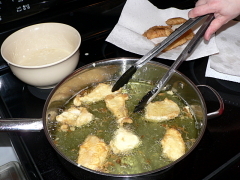 Once the oil is hot, dip the fillets one at a time into the batter. It should be very thin. Let it drip off a little before putting it in the oil. Fry in several batches. There should be a little room around each piece, or they will stick together and not cook evenly. Turn them over once when the edges start changing color. It will probably take less than a minute per side. When they are golden brown on both sides, remove the batch to a plate with a double layer of paper towels.